Several boxes of signature petition sheets that I-735 sponsors delivered Wednesday afternoon. Sponsors of two initiatives to the 2016 Legislature delivered signatures to the state Elections Division Wednesday afternoon, one day before the Dec. 31 deadline. 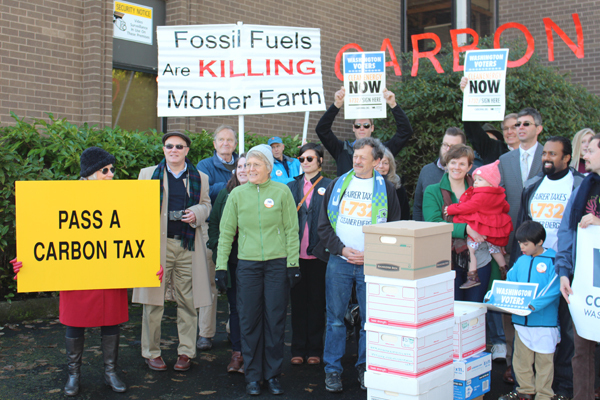 Initiative 732 aims to impose a carbon emission tax on certain fossil fuels. 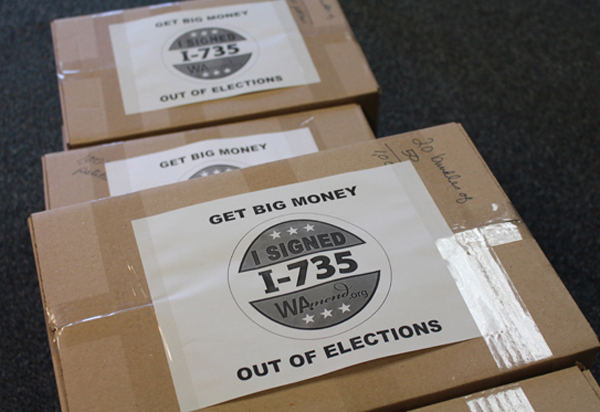 After delivering what the campaign said were 250,000 signatures in late October, I-732 sponsors turned in what one supporter said were about 100,000 additional signatures, for a total of roughly 350,000. I-735 seeks a federal constitutional amendment limiting money in campaign elections. I-735 state field director Steve Zemke said the campaign brought in nearly 330,000 signatures Wednesday, with a few more expected Thursday. Just like initiatives to the people, initiatives to the Legislature need at least 246,372 valid signatures to be certified. Elections Division officials suggest about 325,000 signatures to cover duplicate or invalid signatures. I-732 supporters stand outside the Elections Division office before bringing in their signatures. After Elections staff finishes counting signature petition sheets Wednesday and Thursday, the sheets will be taken to the State Archives for digital imaging, which should be completed sometime next week. The Elections Division will then use a team of checkers to review the signatures, with I-732 being reviewed first, followed by I-735. Elections Division officials said it is very likely that enough signatures were submitted by both initiative groups to do a 3 percent sample check of those signatures instead of a full-blown review of every signature brought in. If a review shows there are enough valid signatures, Secretary of State Wyman will certify the results, sending the measure to the Legislature. There, three things can happen: 1) the Legislature enacts the initiative, thus making it state law; 2) the Legislature fails to take action on it, automatically putting the measure on the 2016 General Election ballot; or 3) the Legislature approves an alternative to the original initiative, with both winding up together on the 2016 fall ballot.